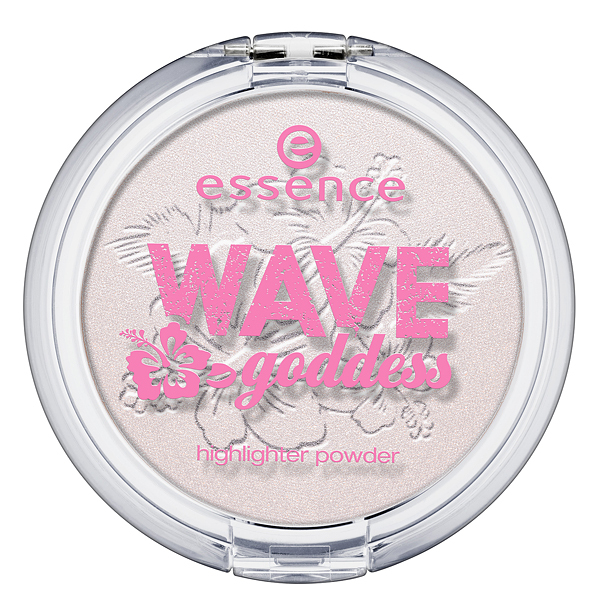 Surfer girls and beach beauties take note: we’re heading to the beach and getting ready to surf with the new essence trend edition “wave goddess” in July and August 2014. Body boarding, stand-up paddling and surfing are the trend sports of the summer! 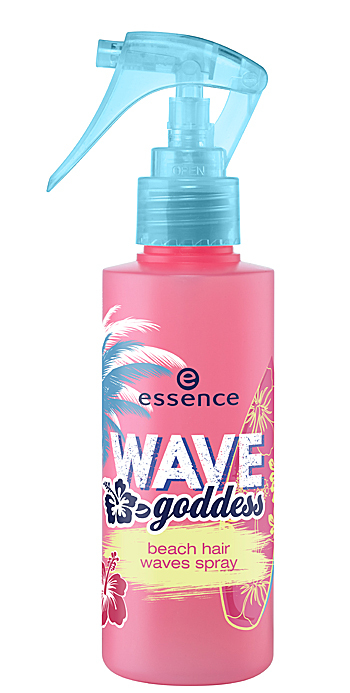 and “wave goddess” offers the ideal products for fun times at the beach or in the water! On top, the absolutely stylish beauty pieces have a gorgeous hibiscus blossom design to create a true summer feeling! There are plenty of must-haves: two fabulous products with a tint effect for your lips and cheeks, a top coat that changes the color of your nail polish depending on the temperature [not available in Italy ç_ç], and a styling spray with sea salt for beautiful, wavy beach hair. 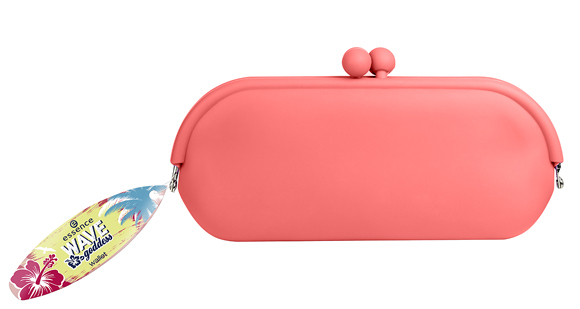 The trend edition also offers two summery accessories that shouldn’t be missing in any beach bags this season: a wallet [not available in Italy] and a case for your sunglasses! so grab your board and head for the waves...with Essence! This trend edition will be available in Germany, Austria, Switzerland, Slovenia, Croatia, Serbia, Bosnia, Romania, Spain, Italy, the Netherlands, Australia, South Africa, Russia, Libya, Iran, Algeria, Taiwan, Brunei and the Philippines. 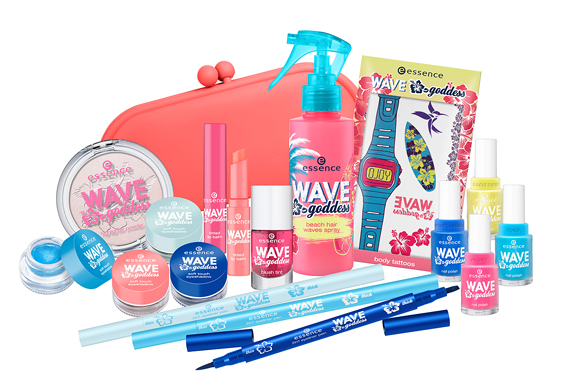 Surfiste e bellezze da spiaggia prendete nota: a luglio e agosto 2014 tutte pronte a surfare con la nuova trend edition essence “wave goddess”. Body boarding, stand-up paddling e surf saranno gli sport di questa estate e la “wave goddess” offre i prodotti ideali per divertirsi in spiaggia e al mare! La trend edition è caratterizzata dai colori brillanti della stagione estiva: arancione, rosa e soprattutto il colore dell’estate – il blu! Must-have assoluti: due favolosi prodotti con effetto colorato sulle labbra e le guance e uno spray con sale marino per i vostri capelli. La trend edition offre un accessorio che non può mancare nella borsa da spiaggia: l’astuccio porta occhiali da sole. Prendi la tavola da surf e vai incontro alle onde...con essence! these long-lasting eyeshadows with a creamy formula are ideal for the summer. 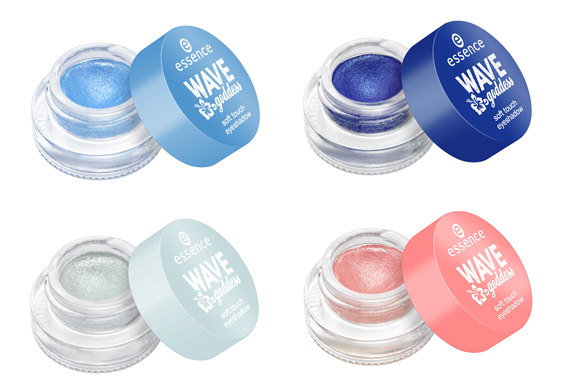 the bright colors with a shimmer finish let you create a refreshing eye make-up look. and the soft gel-based texture even has a light cooling effect! available in 01 have a break, 02 crush on blue, 03 stand up and paddle and 04 life is better when you surf. brillante. La texture leggera a base di gel dona una leggera sensazione rinfrescante, ideale per affrontare le giornate estive! Disponibile nelle versioni: #01 have a break, #02 crush on blue, #03 stand up and paddle e #04 life is better when you surf. the 2in1 eyeliner conjures-up long-lasting eyeliner looks. the duo pencil with a thin tip on one end and a broad tip on the other allows you to create diverse surfer styles that can handle any waves, no matter how big! available in 01 life is better when you surf, 02 have a break, or two and 03 stand up and paddle!. Point break! 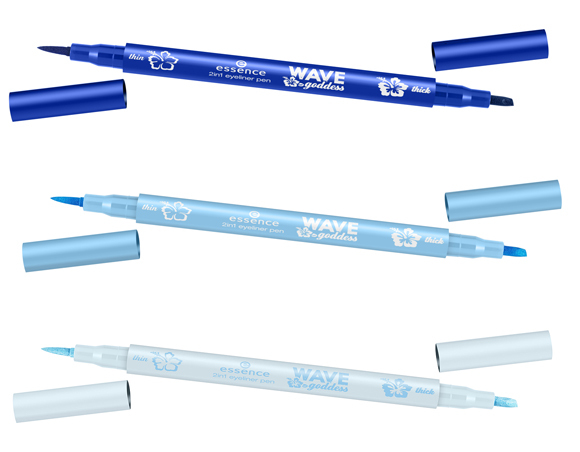 L’eyeliner occhi in penna 2in1 in tre colori blu, turchese e azzurro ghiaccio assicura un look a lunga durata. La matita duo ha la punta sottile da un lato e più larga dall’altro per creare diversi surfer style, resistenti a qualunque onda! Disponibile nelle versioni: #01 life is better when you surf, #02 have a break, or two e #03 stand up and paddle!. the tinted lipbalm is ideal for spending hours out in the ocean. both versions ensure smooth lips with a light tint – in trendy pink with a cool neon finish. absolutely essential for all beach beauties. available in 01 loose your heart on the board and 02 life is better when you surf. Surf ‘n' style! Il balsamo labbra colorato è ideale quando si trascorre tanto tempo in mare. Entrambe le versioni regalano labbra morbide e leggermente colorate in due nuance trendy rosa con un finish davvero cool. Assolutamente indispensabile per tutte voi! 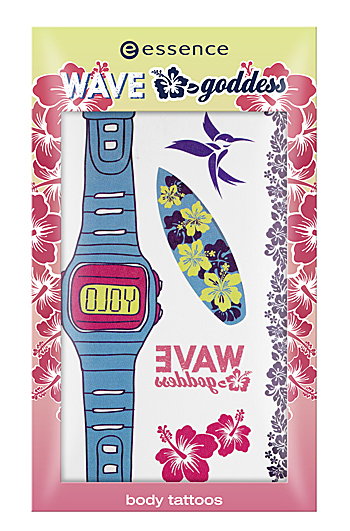 Disponibile nelle versioni: #01 loose your heart on the board e #02 life is better when you surf. no matter whether you prefer surfing or paddling: the tinted blush gives your cheeks a natural flushed look while you pursue your cool water activities. especially long-lasting thanks to the tint effect. available in 01 loose your heart on the board. Water sport! Preferisci lo stand-up paddling o il surf? Il blush regala al tuo viso un colorito leggero e naturale mentre ti diverti in acqua praticando il tuo sport preferito. Disponibile nella versione: #01 loose your heart on the board. the powder contains light-reflecting pigments and apricot glitter particles to give your face and neckline a natural glow. the nuance adapts to suit your skin tone and can be used as a highlighter or for an all-over shimmer. available in 01 sparkling goddess. Smile & wave! La cipria contiene pigmenti cangianti e glitter nel color albicocca per regalare al viso e al décolleté un effetto illuminante naturale. La cipria ha una nuance che si adatta al colore della tua pelle e può essere utilizzata anche come illuminante. Disponibile nella versione: #01 sparkling goddess. these nail polishes offer a high coverage so you can create long-lasting, summery nail styles. and on top, there’s a matching flexible rubber ring in the color of each nail polish – the perfect accessory for the water escapades! available in 01 loose your heart on the board, 02 wave down the lime, 03 have a break and 04 crush on blue. Sunshine colors! Gli smalti nei colori trendy rosa, lime, turchese e blu offrono un’ alta coprenza per realizzare dei look estivi a lunga durata. Inoltre troverete un grazioso anellino in gomma in tinta con lo smalto – perfetto per essere indossato anche in acqua. Disponibile nelle versioni: #01 loose your heart on the board, #02 wave down the lime, #03 have a break e #04 crush on blue. the body tattoos come in cool designs like hibiscus blossoms, seashells, waves and a trendy watch with “yolo” on the display perfectly round off your wave goddess look. use as desired and remove again with soap and water. available in 01 the early bird catches the wave. Skin style... I tatuaggi adesivi per il corpo si presentano in perfetto style wave goddess: i motivi molto trendy come i boccioli di ibisco, le conchiglie, le onde e l’orologio con la scritta “YOLO” sul display si rimuovono facilmente con acqua e sapone. Disponibile nella versione: #01 the early bird catches the wave. gorgeous beach hair for the perfect surfer girl look: this styling spray is enriched with sea salt to give your hair awesome volume and a wavy structure. for a casual, fresh look like you’ve been surfing in the summer breeze! absolutely cool holiday hair. available in 01 wave me up!. Wavin’ hair! Capelli perfetti per un look da perfetta surfista: lo styling spray è arricchito con sale marino per donare ai capelli maggior volume e una forma morbida. Per un look casual e fresco come se stessi surfando nella brezza estiva. Disponibile nella versione #01 wave me up!. don’t know where to put your beloved sunglasses when you get back on your surfboard? we’ve got the ideal solution with this super-cool sunglasses case made of light silicone material in neon orange. once your glasses are safely stored, get ready to hit the waves. available in 01 life is better when you surf. Fun in the sun! Non sai dove riporre i tuoi occhiali da sole preferiti quando stai facendo surf? Noi abbiamo la soluzione perfetta: con l’astuccio portaocchiali super cool in silicone color arancione fluo. Ora che i tuoi occhiali sono protetti, preparati a cavalcar le onde. Disponibile nella versione: #01 life is better when you surf. Il tuo swatch è bellissimo, Simona!! Appena metti l'azzurro linko anche quello! They do, I love the ones with hidden shimmer! Dai che mancano swatch degni del fucsione!!! Eh, chi lo sa...Magari ha lo shimmerino incantatore (che ti frega), io credo di avere un Lime Up! preso in saldo minimo due anni fa e mai messo, magari con quella scusa resisterò!